With the 4th of July just around the corner, I've been in patriotic mode, making lots of cards in red, white, and blue colors. For this I used a SU! framelit die for the large tag, a SU! scalloped top punch for the striped panel, and 2 more SU! framelit dies for the red and white panels. The sentiment is from LOTV, and I added a strip of light blue dsp diagonally, with 3 negatives from a SSS star border die. The embossed background is from Darice, and the bow was done with some divine twine from Whisker Graphics. I'm entering this into the Shopping our Stash #208 challenge which is to use a button, a bauble, or a bow. I'm also entering this into the Cards in Envy challenge which is red, white, and blue. Last but not least, I'll enter this into the Simon Says Stamp Wednesday challenge which is anything goes. Have a great last day of June everyone, and thanks for stopping by! RED, White and Blue!!! GREAT card for this WEEK! Loving all that wonderful red, white, and blue and the STARS! So pretty. Great way to use the tag too. Fantastic, Carol! Lookie how you got this beauty into so many challenges! I love this red white and blue card, the layered tags look great and the starry embossing makes the perfect background. The little coloured stars add a nice finishing touch too. You use tags so well. I think it's time for me to do a little work in the red, white and blue department too! Great job on this one! Very beautiful patriotic CAS! Love how you used the tag, so unusual and very impressive!The little stars on the embossing background look so well! Another wonderful card. You always give me great inspiration. I really like all the layers you did for the tag. And those little stars are darling. Fab card. I love how you used the tags set and then the stars embossing in the background with the red, white and blue colors....just perfect! Love that multiple layered tag and the embossed background! Thanks for playing along in the Cards in Envy Challenge! Wonderful card! Love the classic colour combination. Thanks for playing along Simon Says Stamp Wednesday Challenge -Anything Goes! Great use of the red, white and blue Carol!! Thanks for joining the SHOPPING OUR STASH crew for our "Baubles, Buttons & Bows" challenge this week! fun tag and layers!!! thanks for playing along with Cards in Envy!!!! 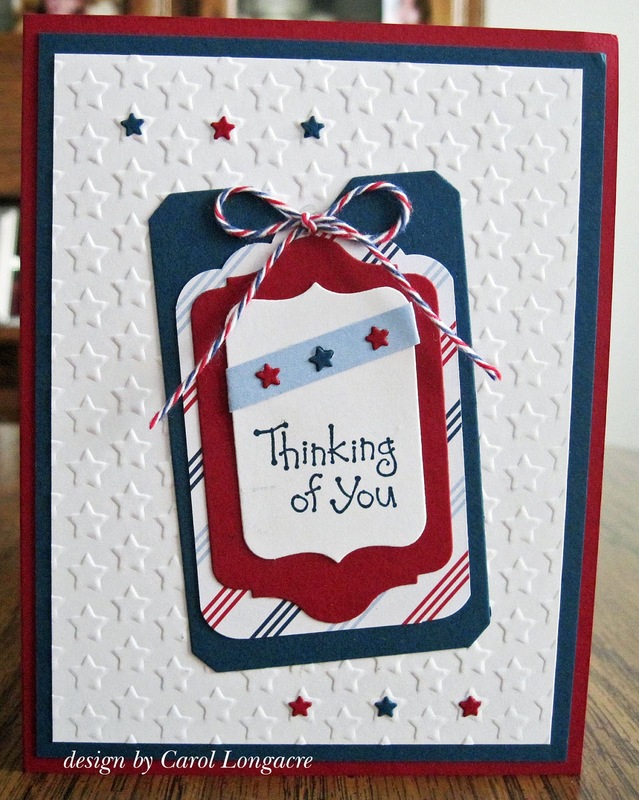 A wonderful patriotic card Carol, the embossed stars are perfect. SUPER card! I think the strip of light blue card stock is truly inspired. I love all these tags layered up like that. Who knew they would be so good together. A great patriotic card!